Rated 5 out of 5 by MoonDragonRider from Most Beautiful and Fun Hidden Object Game! I love this game and have played it many times since owning it! This is one game you will never tire of. The scenery is SO pretty and there is lots to do within the game. Fun for the whole family of most ages. Thanks Big Fish Games for making all these wonderful games for us to play! Rated 5 out of 5 by lakemj1 from Just enough challenge for me - Phenomenal! I really enjoyed this game. It provided a lot of variety in places to explore and puzzles. I prefer to have a variety of puzzles to solve instead of the repeated hidden object challenges. I had to use some hints but it was a moderate challenge. Engaging! Rated 5 out of 5 by FunwithBigFish from Great minipuzzles Really loved this game. Visually stunning, fairly complex storyline, lots of new kinds of puzzles. Looking forward to more in this series! Rated 5 out of 5 by kayleetje from GREAT GAME, design, puzzles and story are great!! love the games of phenomenon !! this is great all the way, this is a game that you will have a lot of fun with and the grapics are so beautifull, job well done, game designers this is a winner, no doubt about that!!! Rated 5 out of 5 by OwlMt from Challenging fun filled game One of the best games in recent years! Complex, yet kept my interest throughout! Rated 5 out of 5 by denniann2 from a very enjoyable relaxing game played casual, no sound. vo and characters seemed to be in time. skips/hints fill fast. you have shown up on this island to find your parents and meet gloria, a little girl that helps you throughout the game a little bit. the parent thing is lost after a few minutes in the game but it is not necessary for the game. you kind of forget about it until you finish the game. graphics are very good and the hidden scenes are double. you get to one and there is a timepiece and you warp to another one and have to find the items and then it takes you back to the first one and the object you couldn't find in the first one is where the timepiece, that took you to the second HO scene, is where it is when you warp back. interesting concept. i like this game a lot!!!! 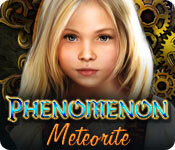 Rated 5 out of 5 by Italia47 from Phenomenon: Meteorite is Phenomenal! I've played so many games that I cannot remember one from the next at times. And I'll leave the details about what this game entails, storyline, etc., to those great reviewers who have the patience to do so. I'm giving this game a 5-star, even though I'm 3/4 through the game. Phenomenon: Meterorite is innovative, clever, a huge variety of things to do and the objects in your inventory, save but a few, you will be using right away. Extremely clever game and it flows. I lose patience with games that are somewhat chaotic. The introduction is great; the graphics, in my opinion, are very good (not excellent) but you are able to find the HO's. Mind you, the artwork is not bad, I just prefer beautiful countrysides and mansions, and whatnot, but you will be taken to interesting places and developments. Bravo to the developers of this game. Very well thought-out. One of my favorite and fun tasks was inserting pieces of stain glass to complete the picture. Not the same old 'roll the wheels' bit to complete a picture. I felt this game had a slow start but then 'she' rolled! For most challenging games you need to have a good mind-set. It's a game where everything eventually falls into place. For me this is pleasurable. Enjoy! Rated 5 out of 5 by Anigisdi from EXCELLENT FROM BEGINNING TO END Loved it. It was a joy to play. The story was engrossing, the puzzles worked well within the story line, hogs were very interesting, couldn't ask for a better game. Rated 5 out of 5 by munvig from Love games without monsters and running back and forwards This was a game I really liked to play. It gave a lot of challenge and it was so nice to not meet a lot of skulls and monsters and blood and weapons. The HOS was quite easy but there was some other challenges in the game that gave satisfaction. And it was loooooong, took several hous to playm loved it! Want moore in this style. Rated 5 out of 5 by Scarlitlake from Beautiful Game! Some of the very best art I've ever seen in a game. I loved the twist on the HOS scenes where you go to a different time space and clear up the last remaining object. I loved everything about this game, except the ending. Very abrupt and unfulfilling. I guess I should have waited for the CE. Rated 5 out of 5 by spearmaiden77 from Awesome game This game and its predecessor are the most visually beautiful games I've ever played. I want to live on these islands! The only quirk was the abrupt ending. Didn't get to see the island explode. Oh well, still a great game. Rated 5 out of 5 by Celestien from Wonderful game with beautiful scenes This was a very good game to play. It's a long game, new scenes and worlds keep coming for a long time, filling me with wonder. The storyline is good, the characters too. Challenge enough and logic in the gameplay too. The HOS's are original: you have to look for objects in two different times. HOS scenes are repeated but not too much. Only the ending was a bit sudden for me. But I felt very well entertained at the end. More of these, please! Rated 5 out of 5 by bishky from Bought it - Played it - LOVED IT!! I did the try me in CE and was anxiously waiting for the SE. I bought it and finished it and loved every minute. You really have to think about what needs to be done next and if you get lost (I did a few times) the help button will take you there. It is beautifully drawn and the voices and music are good. Lots of things to do and collect to make get the hidden object games completed. There is a second game inside the games that needs to be played to get the object you need. Everything is clear and easy to identify. They are not easy but very doable. As you collect objects you also get elements that give you power. It is a very good game and I hope they do a sequel. I really enjoyed it and I will play it again in about a month or so and enjoy it again. I hope you will too!! Rated 5 out of 5 by doors1 from Different and Enjoyable I really enjoyed this game, Hidden Object with a twist. Great graphics and sound, cool story line and a decent level of challenge. I don't think anybody that enjoys this genre will be disappointed. Rated 5 out of 5 by mlw14 from Excellent! This game is a must-play! Interesting challenges with an enjoyable storyline. The music was good, it did not over-power the game or storyline. The scenery was beautiful as it was interesting. I never got bored playing this game. I looked forward to playing it. It was slightly shorter than I would have liked but I like the game so much that I must have played through it quicker. I look forward to playing the Phenomenon: City of Cyan. Rated 5 out of 5 by pinkwitch12 from Fun Fun Fun I can't say enough about this game. I just played this one. I have the first one, the city of cyan, and this one just gets better to the tune of ten. Long, lots of puzzles. an added bonus of a hidden object within a hidden object to find the last piece of the initial one. Not boring to me, and I have played many over my year and a day with HOGs in this pond now. You get help from the hint thingy, but I just used the arrow feature for the most part. So riveting I found myself playing all the way through, for hours of fun on a hot afternoon when I had to be indoors. I wanted to know more abut the little girl, and how she knew so much about so many things....hope for a sequel. She was gorgeously drawn....all of the characters were very realistic. I recommend this game. Glad I bought it. Rated 5 out of 5 by odarney from Outstanding, long playing Graphics - A+. Sound - A. Storyline - B+, Difficulty - A. Overall fun - A+. I thought this game was great! Rated 5 out of 5 by agedog1 from Lots of fun I love adventure games but almost all games on bigfish are HOGS. This particular game is very colorful and the characters are interesting. Puzzle's aren't to hard and the map feature works so you don't have to go back and forth running all over the place. Rated 5 out of 5 by TheMagus84 from Complete lack of frustration... Review of Demo: I trialed the demo of this game & it seemed pretty good, I don't remember why I thought to wait for the SE, maybe I wasn't interested in the bonus content. Anyhoo.. This game is very linear, in a very good way. It doesn't restrict you from doing anything just to stay on track, which is my usual complaint about linear games. You use your inventory items relatively quickly. You aren't left wondering "Which of the 30 tasks that I have am I able to complete now, if any?" You usually have no more than 4 tasks at a time. When you find a locked gate or door, you get what you need to open it before too long. This set up makes for a very comfortable game. I haven't felt frustrated at all. The puzzles are decent. Most are easy-moderate difficulty, a few hard ones. Not too many HO scenes, and I have yet to get a penalty for rapid clicks. Which for me is a big plus. I became tired of HO scenes awhile back but I still love the adventure parts of the games. So now I'm guilty of just clicking on the objects that stick out until I'v completed the scene. So no click penalty is very nice. Why force those that don't like those scenes to slow down, get frustrated and not enjoy it one bit. Especially in games that have far too many HO scenes, you just get done with one long boring click penalty fest and have to go through another. I am happy to say this game is not like that AT ALL. The story is interesting. I am rather curious as to what happens at the end. The characters are well drawn, I can't stand the artwork in some games that make the characters look like their skin on their face is melting off, or a bad sculpture. I highly recommend this game. Rated 5 out of 5 by kordi044 from Phenomenon Meteorite Great graphics. Exciting game. Challenging, keeps your attention. Rated 5 out of 5 by neilskinut from not hard and different in play Graphics are good and has voice over. Not a hard game and has a good flow to it. The HOS are not all that often but are different. 2 parts of them to solve. Items can be hard to spot but the hint button works really good there and through out the game. Puzzles are good also and not that many. The game will give you hints on what to do even if you do not ask which is good. Give it a try not a bad game. Rated 4 out of 5 by hermitcave from Meteorite Island justice - Cross-clan marriages banned and children born to such parents sentenced to death Hundreds of years ago a meteorite hurled toward earth and split into four chunks in the atmosphere and landed in four different parts of the same island. Those that survived established four different societies, each around the mystical powers each chunk emparted to them, that of Air, Fire, Earth and Water. A significant event occurred with the first children being born with these mystical abilities and this triggered clashes between the clans and a race for the power of special abilities. The four clans began feuding which turned into war almost destroying all four clans. some individuals were able to become more powerful by being able to control some combinations of the four powers. After many years of war, an armistice was finally reached with each clan agreeing to remain in their own part of the island and banning all relationships between them including marriage between the clans. Children born to parents from different clans were considered criminals and were put to death. Daniel was only 5 years old when his parents packed a suitcase full of gold and left him on the doorstep of foster parents 20 years ago with a note that they were in danger and they must leave their son to ensure his survival. They took him in and treated him as one of their own. When Daniel turned 25, they gave him an old box containing a map and a note from his real parents that told him that once he was 25 he would be in grave danger and must use the map and travel to the uncharted location of Meteorite Island immediately to discover the truth about himself and that they would be waiting for him if they survived. Spending two days on a ship, Daniel arrives at Meteorite Island and meets a young girl, Gloria, on the beach who has been expecting him and tells him about the meteorites that hit the island long ago and the special powers the people gained. She provides the first clues to why he was sent off the island and tells him she was also saved by a watchmaker that took her in as she was from a forbidden marriage between parents from different clans as he was. She tells him that she can help him with clues as he searches for answers and that at the age of 25, children born on the island begin to obtain the special mystical abilities but that he will need acquire an Amulet of Elements to collect, save control them. There is also a special weapon that is used to protect the island from other meteorites that needs to be repaired and he will need to develop his powers so he can repair it. The graphics are very colorful and detailed with well done animations and some very good voice acting and characters right out of some modeling agency. The two main characters are so "pretty" that the other characters seem drab next to them. Music was easy listening and non-invasive which was a plus given the length of the game. This is a simple, well crafted story capable of holding your interest as details are unfolded as you explore small sections of the island. There is a very nice jump map with action areas indicated that is only open to the small area you are exploring at that time so you always know where to go. There is a task list and a journal keeps track of the story and island history pages that are found throughout. Cutscenes are replayable from the journal. The inventory puzzles and minigames were fairly easy and fit into the story and you were not overburdened with a lot of inventory items. Hidden object scenes were the usual interactive list type with a new twist - somewhere in the scene is a hot spot with a clock that acts as a time warp that, when clicked on, teleports you to another time with another list of objects to find. One way to get double use from each scene. Another feature that was added was an association word finder that, when a word on the list is clicked on, a scrambled word associated with the object to be found is presented that you unscramble and the object is found. To see what it did, I used it once to find the tomahawk and was presented with the letters that spelled "indian" and then it showed me the tomahawk. A different form of a hint button I guess. Another secret island hidden somewhere on Earth and another child removed from where they were born and being drawn back to their homeland to find missing parents. Phenomenon: City of Cyan was a young girl, Monica, and this time it is a boy named Daniel and the people are able to control the four elements and there is a meteorite heading for earth that needs to be destroyed. On the edge of reality? No, it is a fantasy after all. The story was interesting and the plot opened up slowly so you get dragged along until the final task of the meteorite heading for earth is revealed and you discover the real reason you are there is to fix a weapon that will shoot a powerful beam of light and destroy it. Finding your parents never happens and you never find out what happened to them. And how did Gloria know about you and that you were coming? Did she use the time machine telescope thingy to go into the future and find out? If you can get by some of these unanswered questions, the game can be an enjoyable romp. Rated 4 out of 5 by Yurnmesis from Very Long Game. Rambling Storyline. Overall: Very, very long game, with many easy to complicated mini games and rather rambling storyline. Multiple items for your inventory and underlying concept based on elements. Back and forth to complete tasks, but hint gives you arrow to follow and map will transport you. Good graphic scenes. 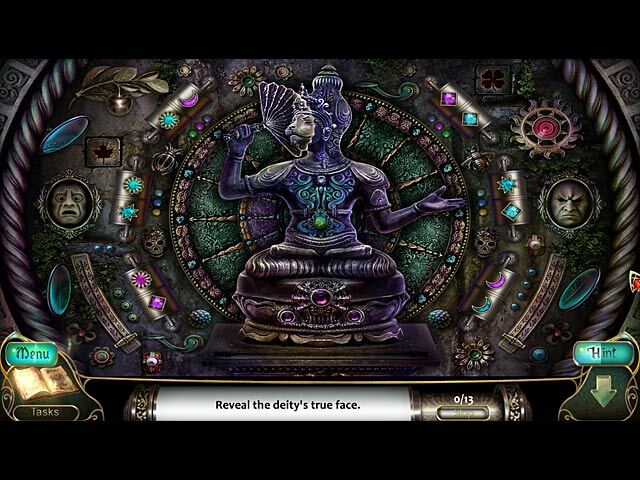 Hidden object games come in set of two that you must switch between. Sadly this wasn’t a game that I was eager to return to see what happened next. Graphics: From very good to good Sound: Repetitious Voices: Well done. Uses humans, but not well animated when speaking. Most are attractive, but the monk’s eyes are a little creepy darting back and forth. Hints: Good. They show you the direction where to go, so follow the arrow. Map: Transports you to next task. Inventory: Sometimes becomes overwhelming with no clue where the item is supposed to go and if you don’t play for a few days, just hit hint or map. Also often you have to try several times to place an item where it belongs, so don’t give up. Hidden Objects: Good. 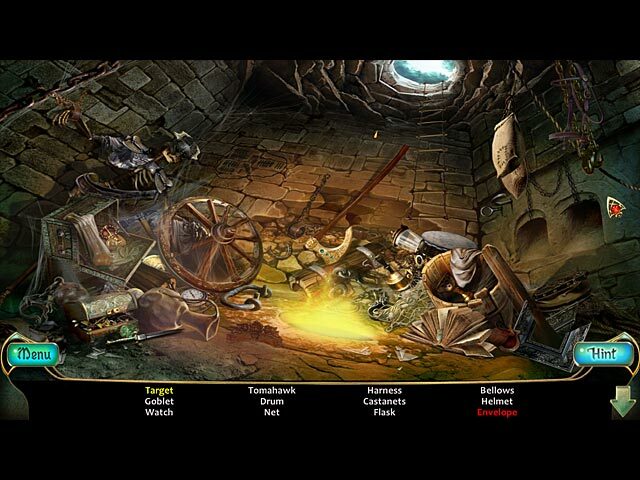 Clear in beginning and darker towards the end.Then more dark corners and dark HO games appear that are very annoying, so you occasionally have to click blindly.You switch using a clock face between two hidden object scenes and you must get all the items in the second scene for the last object to appear in the first scene. Mini games: Varied and numerous and some quite different and interesting. Some easy, some complicated. You create elements, food, different projects, I completed several, but since I’m not a mini fan, I skipped many. Storyline: Concept is interesting and nice scenes, but the logic of finding items lost me, so I just used the hint or the map. The elements are more than simple with combined elements you have to discover, so you need amulets to discover new elements or elemental combinations. Never seem to have a need for them other than discovery. Map: Click on the check mark to open another map to find your unfinished tasks. Note: Pumping Station: You need 2 levers as well as the slot decorations to open the door. It only suggests decorations, so wait until you have the 2 levers and both slot decorations to open it. Also, towards the end the hint stopped working, so I just went back to where I had undone tasks and it started working again. Rated 4 out of 5 by gcrazy from cute game It was a nice game..easy to follow..mini games were challenging. The problem I had it kept locking up on me and I had to keep starting it over and over. Time wasted on trial. Rated 4 out of 5 by Nojhog from Nice Production The Game has a nice atmosphere. It looks beautiful and the music is pleasant. The HOS's are very well done. If you can't find something, you have the option of playing a word game instead, so it is better than hitting the hint button. The puzzles were very good, but there wasn't near enough of them. I felt there was way too much of collecting objects to fit into mechanisms. I would much rather play a mini puzzle rather than place objects into slots. The science fiction nature of the story opened the door for some very unusual mechanisms. This made it difficult to know what you were supposed to do with all of the strange devices you had collected. The hint button was very good at directing you to the correct location and action but I don't like it when I have to use the hint option so much in a game. The ending was left open and is to be continued in the next installment of the series, so it doesn't really stand alone. I enjoyed the game overall and look forward to playing the next one. Rated 4 out of 5 by northswirl2 from Tranquil This game has tremendous graphics - they were a real pleasure to look at. I usually like grey matter workout games, but, for some reason I really enjoyed playing Meteorite despite it not being difficult, and despite the following criticisms. There were too many HOS, especially towards the end of the game, but there is no penalty for clicking all over instead of searching diligently. If you like HOS, you will be impressed by the time switch. There were too many similar objectives – lots of find the key or the object to open something. The end of the game was abrupt, with no closure to the story being followed. I suspect there might be a sequel in the works? If the puzzles and the gameplay were more varied and harder (at least on the hardest level), if there were about 4 less HOS, and if there was some reference to the beginning of the story at the end of the game, I would have given this game five stars. This is an ideal game for a beginner, or any player for that matter, wanting a peaceful, makes sense most of the time linear type of game.